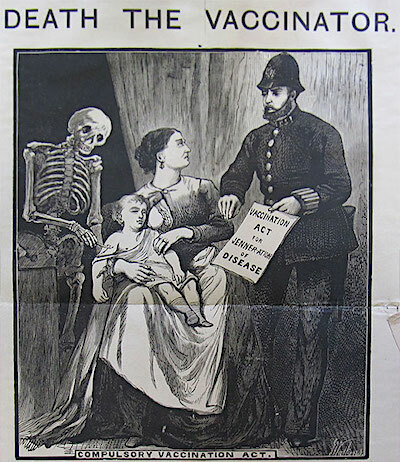 There is a perception out there that vaccines saved us from the deadly diseases of the 19th and 20th centuries. But did they? Please review the evidence below. 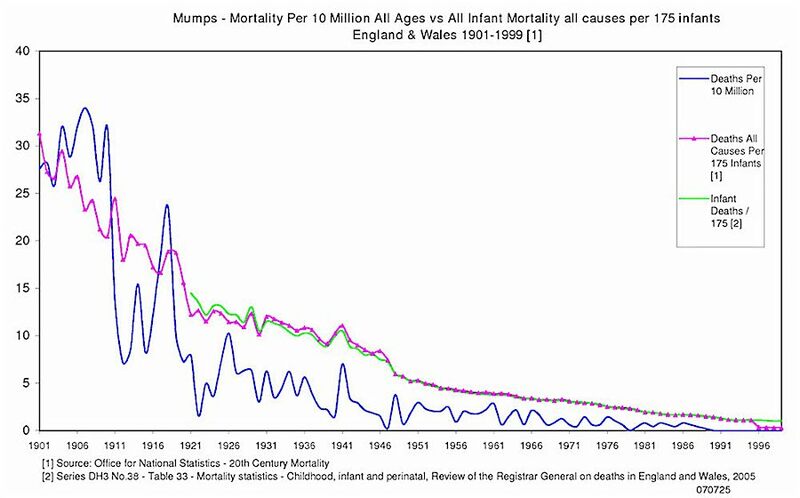 You will see that in developed nations, mortality from these diseases declined dramatically before vaccines came in, with the trend heading downward (smallpox and polio excepted, they have different stories). This was largely even before antibiotics were widely used. Vaccine protagonists argue we can see the worth of vaccines better by looking at graphs showing disease incidence (morbidity), rather than by looking at mortality. However death rates give us the most accurate picture of what is going on—incidence data only includes reported cases, and many cases of disease are never reported, but deaths usually are. Also, although incidence data show declining disease rates after introduction of some vaccines, this is not significant if those diseases had become mild in the vast majority of cases anyway, due to improvements in the health of populations. If the slope of a mortality graph is pointing downwards for a long time with no vaccine, it’s reasonable to expect it would continue to go down if not interfered with, and that serious side effects of the disease would be declining too. 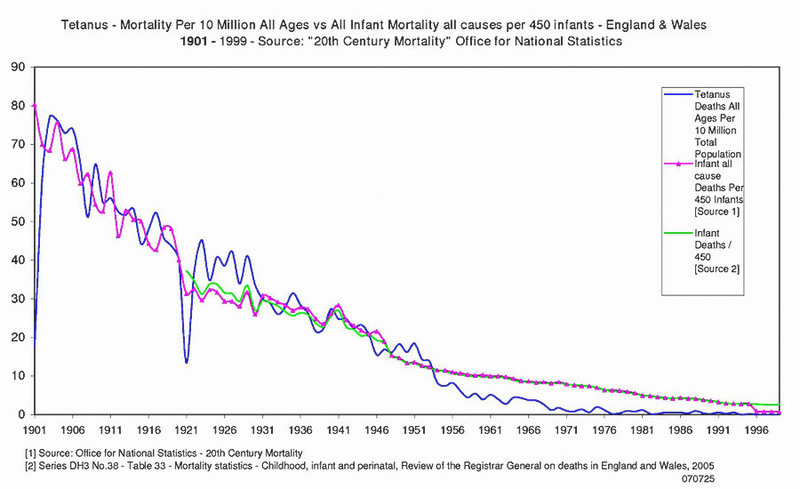 Diphtheria mortality, in England and Wales. Diphtheria vaccination began in 1920, and became widespread in the 1940s. 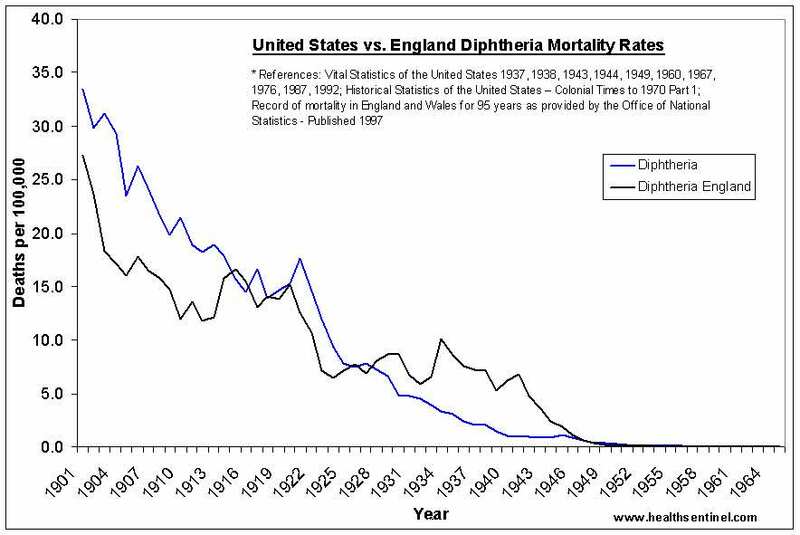 Diphtheria mortality UK vs USA. An early form of the diphtheria vaccine in limited use from 1920, widespread vaccination early 1940s (UK), late 1940s (USA). 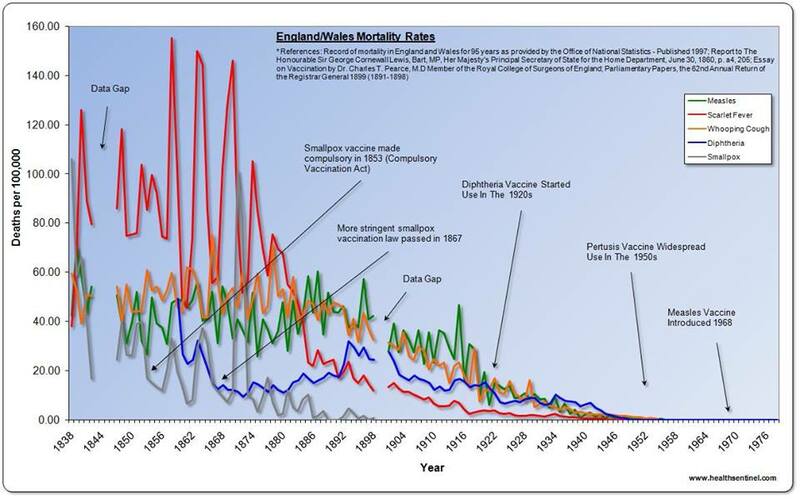 England and Wales mortality for measles, scarlet fever, whooping cough (pertussis), diphtheria and smallpox, 1838 to 1978. 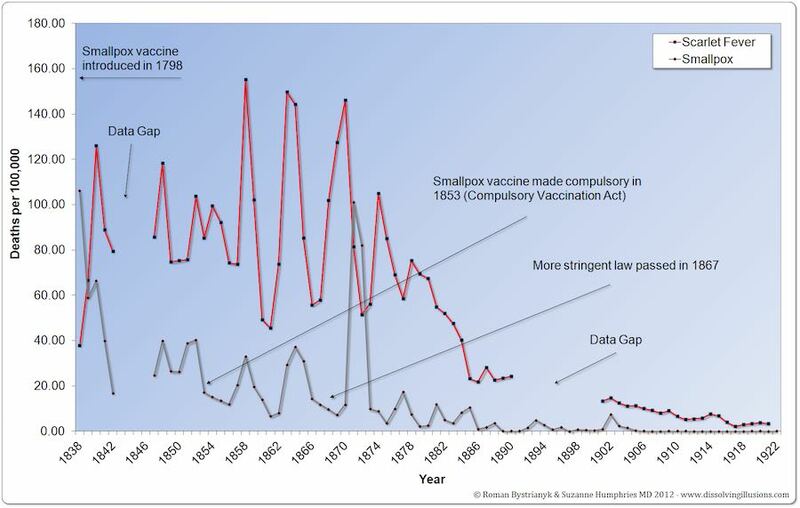 See the huge outbreak of smallpox in 1870, after 70 years of mass smallpox vaccination in the UK, with 2 laws mandating vaccination having been passed and almost 100% compliance. There was no vaccine for scarlet fever. 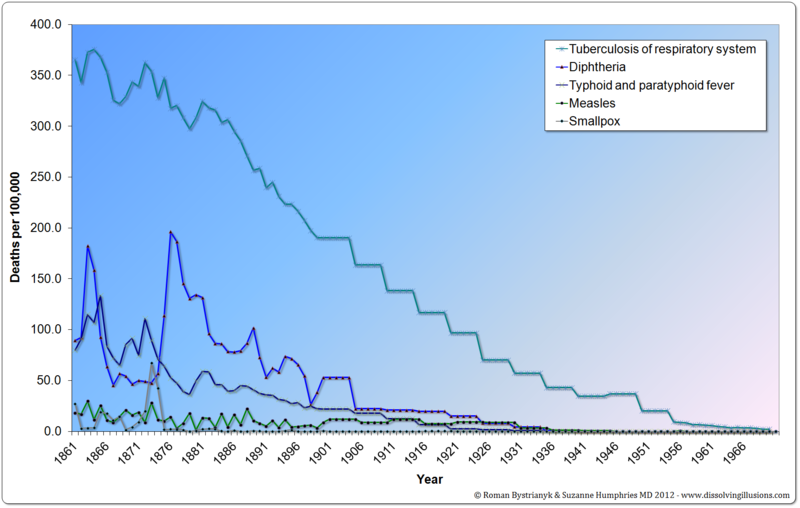 United States mortality rates from various infectious diseases from 1900 to 1965. Notice the diphtheria and typhoid graphs almost match each other, despite the fact there was no widespread use of a typhoid vaccine. There was no vaccine for scarlet fever. 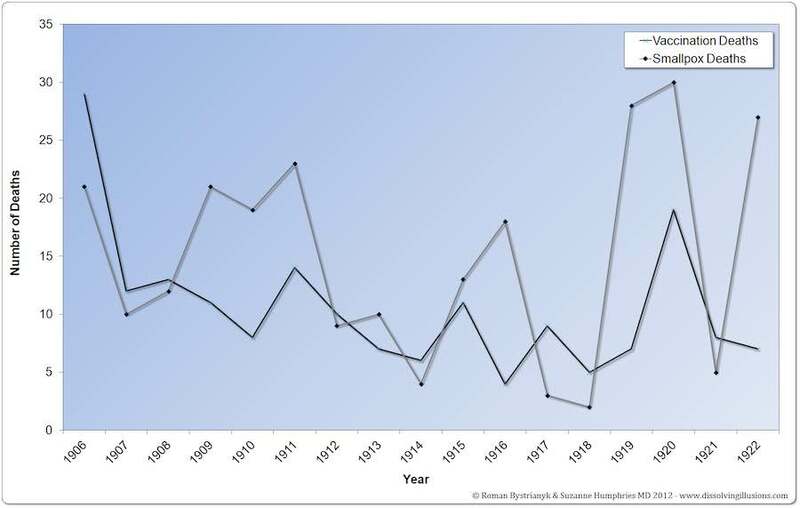 Massachusetts tuberculosis, diphtheria, typhoid, measles, and smallpox mortality rates from 1861 to 1970 (although US national records did not begin until 1900, records in some areas began earlier, and give us a chance to see what was going on before 1900). There was no widespread use of a vaccine for typhoid. 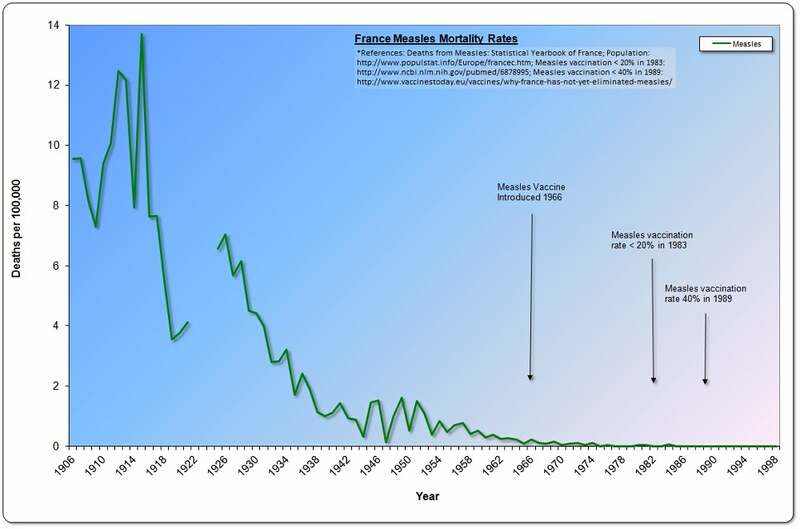 FRANCE measles mortality rate. 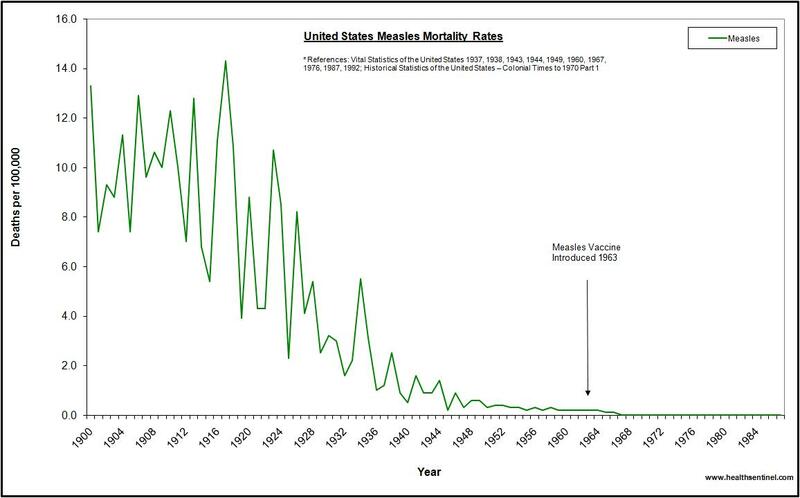 Note – measles vaccination rate was less than 20% in 1983 and less than 40% in 1989. In the US, influenza and pneumonia are bundled together, because influenza leads to pneumonia, and the exact cause of death cannot be determined; we should note that pneumonia can have many causes besides flu, and these cases are included. In Australia, flu deaths are estimated by calculating a fixed percentage of deaths of people aged 50 and over, would you believe it. (One percentage for ages 50-64, another for 65 and over). Source. This means every single person over 49 who dies contributes to the so-called number of flu deaths. Australian flu deaths is estimated to be around 3,500 annually, by the way. This article Flu-related deaths triple in NSW proclaiming flu deaths in NSW had tripled that year, published August 2016, demonstrates a truer number – the most populous state in Australia had only 45 flu deaths by that late stage of the year, so how could the whole country have had 3,500? “What was a bit surprising when we looked at some of the data from Canada and Hong Kong in the last year is that people who have been vaccinated in 2008 with the seasonal or ordinary vaccine seemed to have twice the risk of getting swine flu compared to the people who hadn’t received that vaccine. “Some interesting data has become available which suggests that if you get immunised with the seasonal vaccine, you get less broad protection than if you get a natural infection. “It is particularly relevant for children because it is a condition they call original antigenic sin, which basically means if you get infected with a natural virus, that gives you not only protection against that virus but similar viruses or even in fact quite different flu viruses in the next year. “We may be perversely setting ourselves up that if something really new and nasty comes along, that people who have been vaccinated may in fact be more susceptible compared to getting this natural infection. 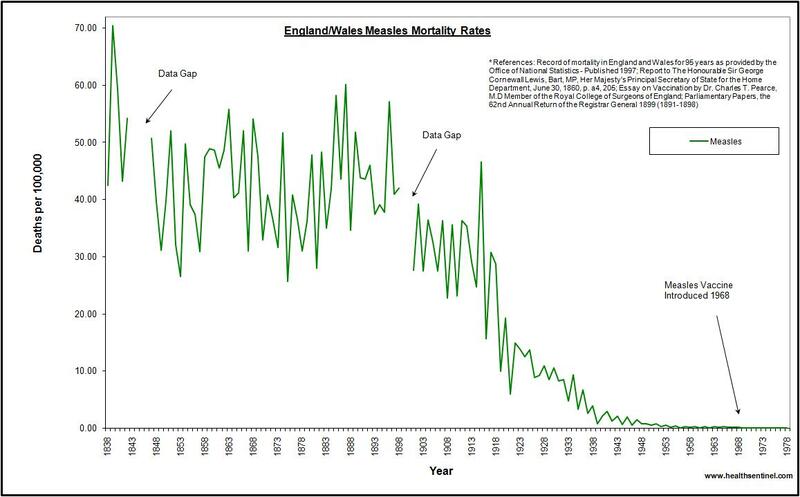 Tetanus mortality England and Wales 1901 to 1999. Vaccine widespread in late 1940s. Note – The numbers of farm labourers fell by half after the second world war, and the increase in mechanisation reduced the chances of the types of injuries likely to result in tetanus. 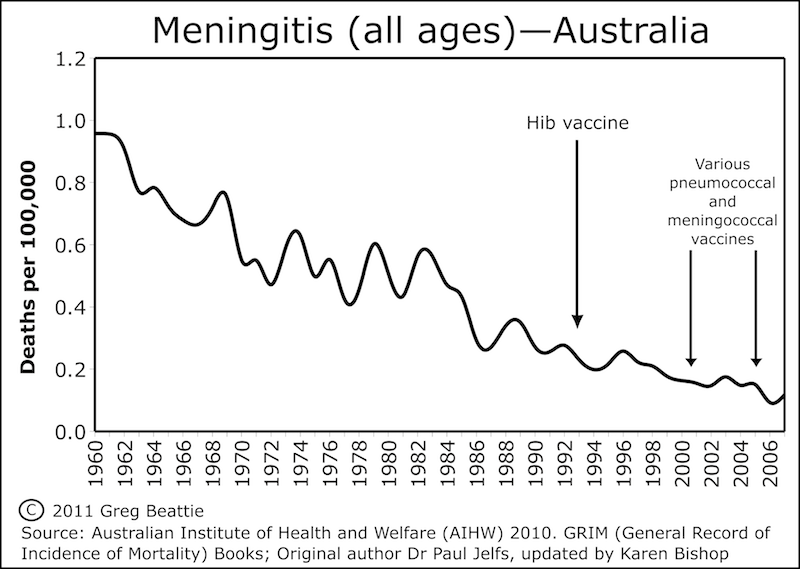 The Hib vaccine was introduced in 1993 in Australia to combat bacterial meningitis – bacterial meningitis can be caused by a wide variety of bacteria but the Hib bacterium was the predominant one found in bacterial meningitis cases at the time. The Hib vaccine reduced the incidence of Hib infections significantly in just two years, and Australian health officials are very fond of promoting this. 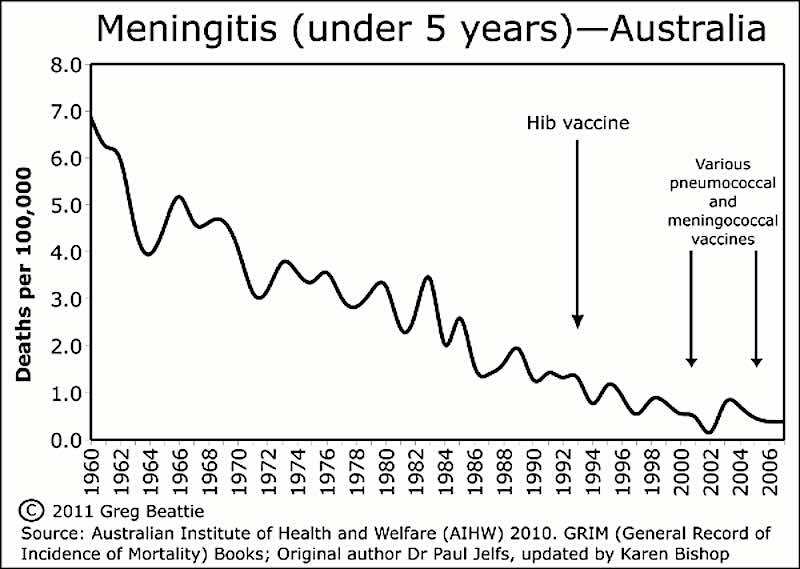 However the next graphs show the Hib vaccine made no difference to the rate of decline in meningitis deaths—there are unlimited species and strains of bacteria that could cause meningitis in a susceptible individual, so others take the place of those removed by vaccination. To remove a few strains of bacteria causing meningitis and say a vaccine has been successful, when the rate of meningitis deaths has not been affected, is fanciful. 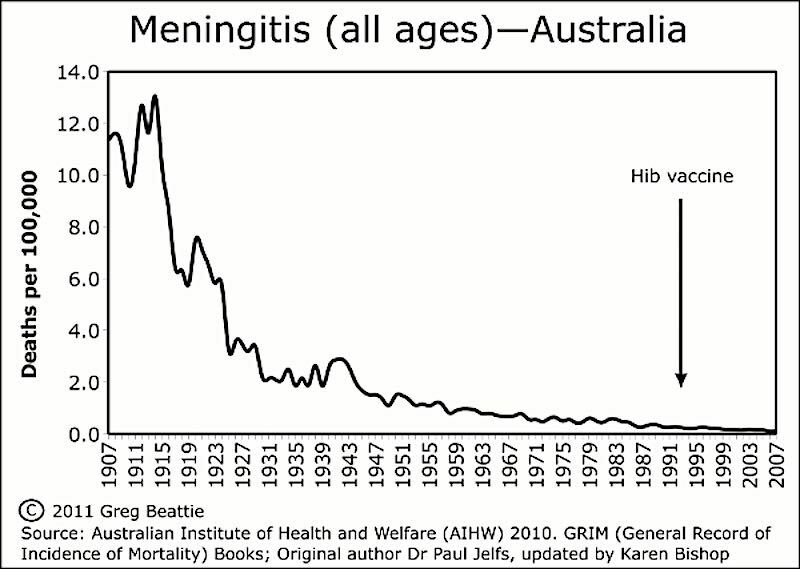 Meningitis in Australia in the under fives. “Polio” is short for “poliomyelitis”, which means “inflammation of the grey matter” affecting the grey matter in the spinal cord and sometimes the brain stem. This inflammation can cause paralysis, usually temporarily, and then it is called “paralytic poliomyelitis”. When the polio vaccine came into use in 1955, polio was officially defined as being caused by poliovirus, an enterovirus that had circulated freely through our gut since ancient times. 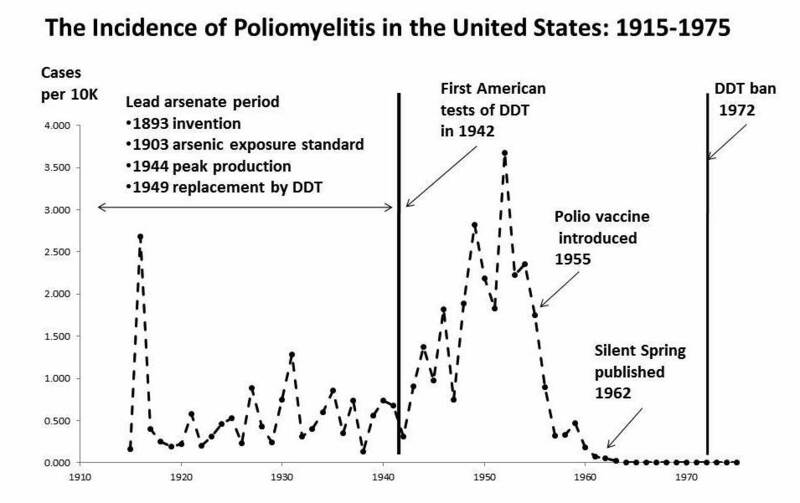 Unlike other diseases that vaccines get the credit for fixing, the first serious US polio outbreak occured in 1894, there was a major epidemic in 1916, then things got worse in the 30s, 40s and early 50s. 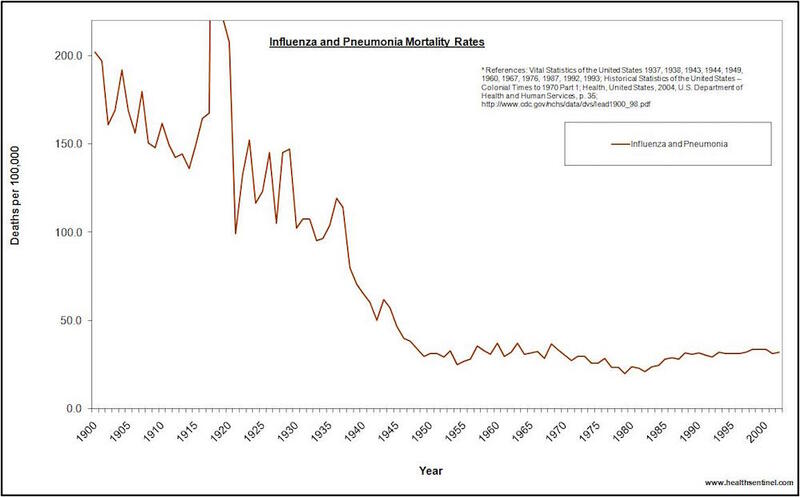 What could have caused this mysterious appearance at a time when mortality from other infectious diseases had declined a great deal? Pesticides lead arsenate and DDT, interacting with a virus or viruses, is a strong candidate. It is possible the pesticides were damaging nerves, allowing the entry of normally-harmless enteroviruses. In the US, lead arsenate was first widely used in 1893 in Boston, and the first larger cluster of polio happened there that summer (26 cases), then the first major epidemic (132 cases, 18 deaths) occurred in Vermont the following summer, in 1894, the year the formula for lead arsenate was first published, by Vermont’s state entomologist. Source. Summer was the time fruit crops were sprayed with insecticides. 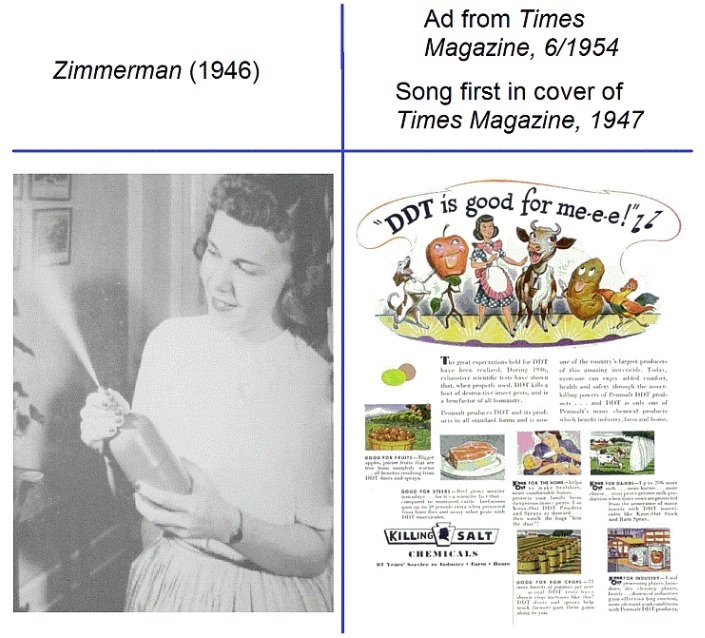 DDT was sprayed around freely in the 1940s and early 1950s. It is still used in India, some African countries and elsewhere. The evidence does show the polio vaccine eliminated outbreaks of polio associated with poliovirus in the US and other countries. However, before the vaccine, polio was usually diagnosed without a pathology test for poliovirus – it was common for doctors to diagnose ‘poliovirus’ so patients could get health funding. 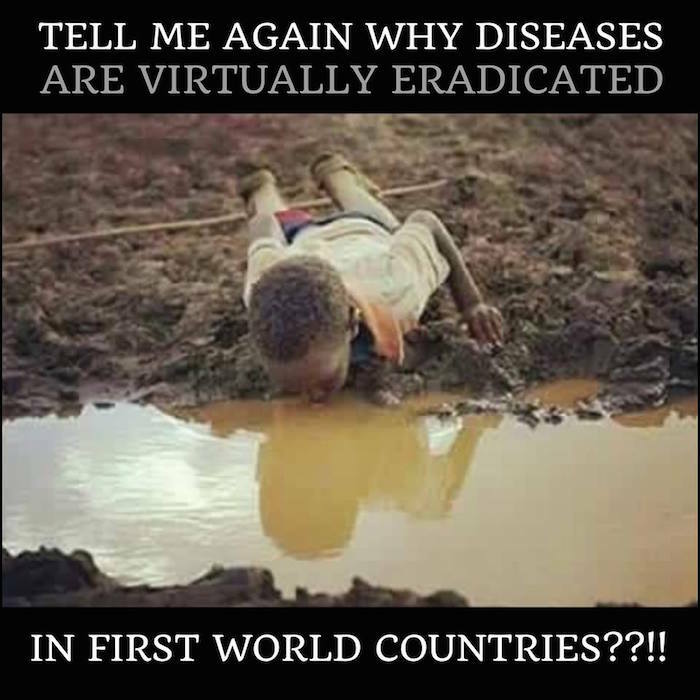 Therefore other enteroviruses besides poliovirus may well have been causing poliomyelitis, or polio may have been simply caused by pesticides without the involvement of a virus (although the fact that polio vaccines lead to many cases of paralysis does point to the involvement of a virus). These considerations have ramifications that continue today, in both developed nations where there are still outbreaks of paralysing “polio-like” illness and in third-world nations. 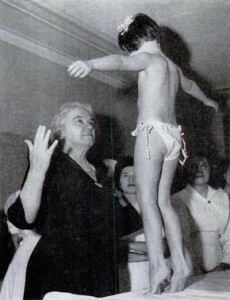 After vaccination was introduced in 1955, a strict pathology test was required to confirm a patient had polio. Also, at this point the definition of polio changed—paralysis had to last for 60 days instead of just 24 hours, and non-paralytic cases were no longer called polio. These factors lowered the number of polio cases significantly, making it look like the vaccine was very successful. 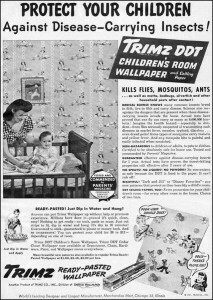 We should also note the book ‘Silent Spring’, which was influencial in DDT use in agriculture being banned, came out in 1962. Note – Australian nurse Sister Kenny successfully treated polio paralysis of limbs with hot packs, massage and gentle movement, instead of with long-term immobilisation, cutting tendons, painful electric treatment and braces. An Australian outback doctor, Dr. Archie Kalokerinos, who visited polio victims on farms, noticed children played in drums of “cottonfield spray”. Smallpox vaccination began around 1798. It was a disgusting, unclean practice and many people died from it—the arm was sliced open and pus from an infected cow’s udder was rubbed into the wounds (a practice that persisted for over 100 years, with fresh pus being replaced by dried cowpox scabs later in the 19th century). 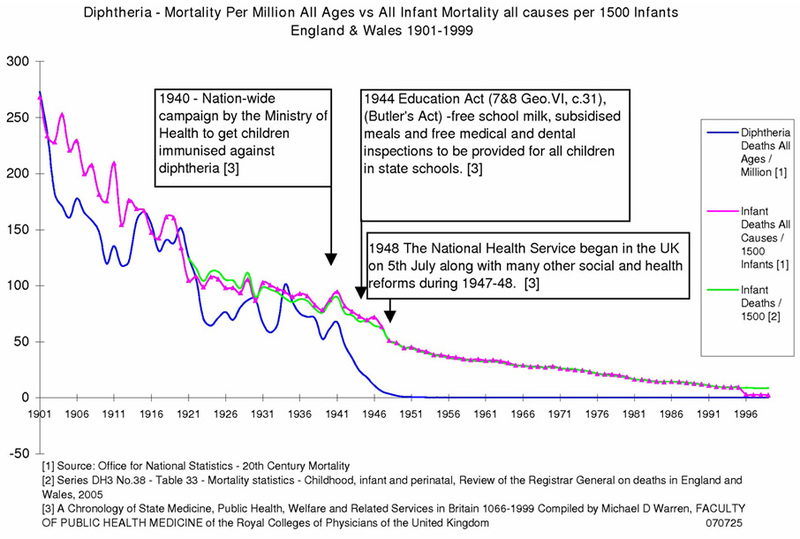 National mortality records began in 1838 in England and Wales, and 1900 in the US, so we have no before and after evidence for the effect of this vaccine. Doctors at the time were enthusiastic, and pushed for laws making vaccination mandatory, in 1853 and 1868 in England. 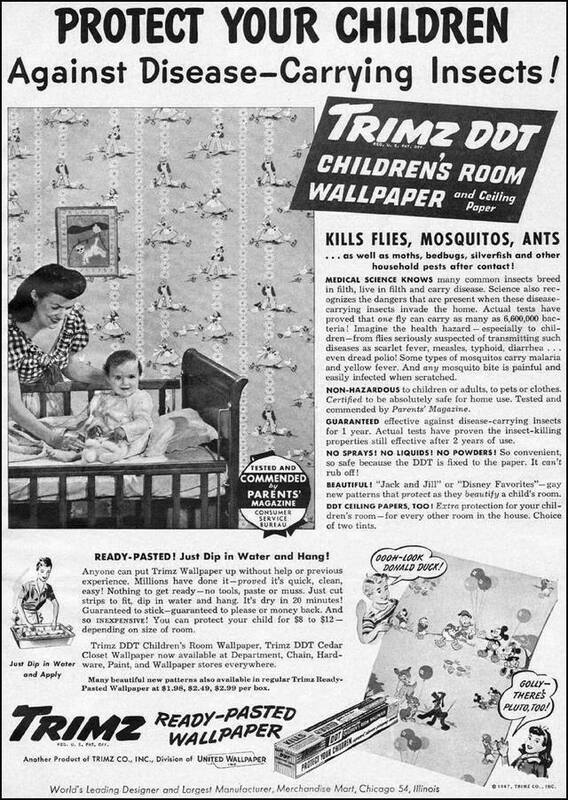 But we should note they were making good money from it, and they were the same generation of doctors who refused to wash their hands between autopsies and internal examinations in women in birthing hospitals, causing high childbirth death rates, believing a gentleman’s hands could not spread disease (the idea that germs caused disease was not promoted by Louis Pasteur till the 1860s, and there was resistance to it by doctors). See Semmelweis reflex or look here:Postpartum infections and look under History. The following figure shows England and Wales smallpox and scarlet fever deaths 1838 to 1922 (sources below). 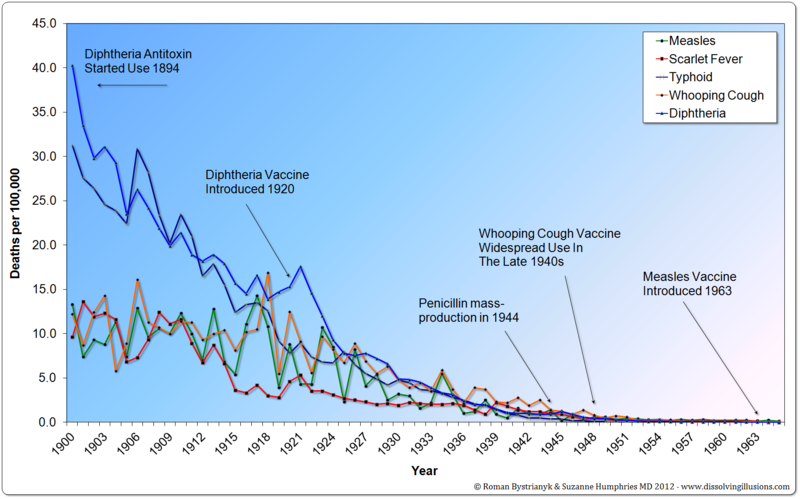 Note – there was no vaccine for scarlet fever, but it declined dramatically anyway (and the bacterium causes strep throat today), suggesting smallpox declined by itself as living and working conditions improved. Also, the 1870 smallpox outbreak was the worst outbreak in England ever, and occurred afer 70 years of vaccination with 100% coverage in many areas, demonstrating smallpox vaccination was of no use whatsoever. England and Wales smallpox deaths vs. deaths from the smallpox vaccine from 1906 to 1922 (source below). This graphic shows the odds of dying from measles in 1962, the year before the measles vaccine came in, along with odds of dying from various causes in year 2000, in the US. 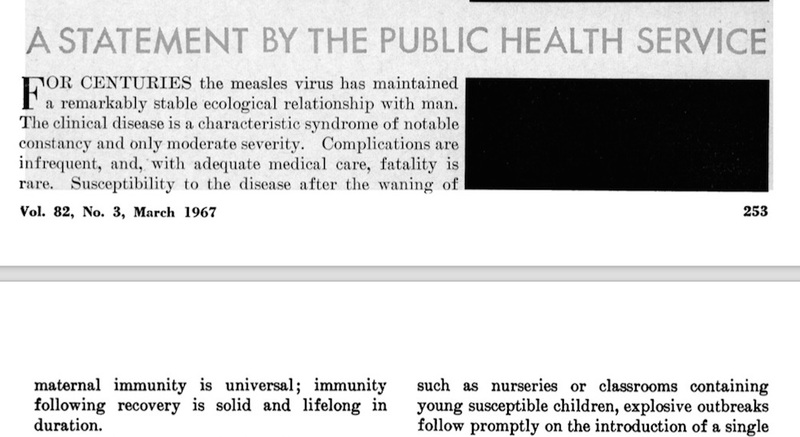 This is a report from the US Public Health Service’s National Communicable Disease Center, Atlanta, discussing the introduction of widespread measles vaccination in 1967, after 4 years of testing. So why did they make the measles vaccine? Source: A. Langmuir, “The Importance of Measles as a Health Problem,” American Journal of Public Health, vol. 52, no. 2, 1962, pp. 1–4. The following video shows measles was considered a mild disease in the 1960s (before the vaccine) – it’s doubtful they would have made jokes like these about diphtheria, before diphtheria vaccination became widespread. There’s one thing wrong in some of these clips: adults rarely got measles, because unlike today, the vast majority had life-long immunity from getting it as a child, and from getting “boosters” from exposure to the measles virus in the people around them – the populaton had a natural herd immunity. Chicken pox vaccine is on the schedule in the US and Australia, but few other countries. This information page from the UK National Health Service explains they don’t vaccinate children for chicken pox because chicken pox vaccination leads to more shingles in older people (chicken pox and shingles are caused by exactly the same virus). If you vaccinate children against chickenpox, you lose this natural boosting so current levels of immunity in adults will drop and more shingles will occur. 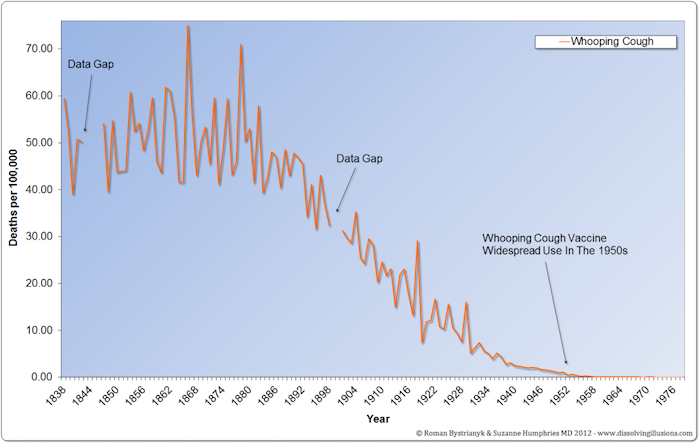 Infectious Deaths fell before widespread vaccination was implemented. 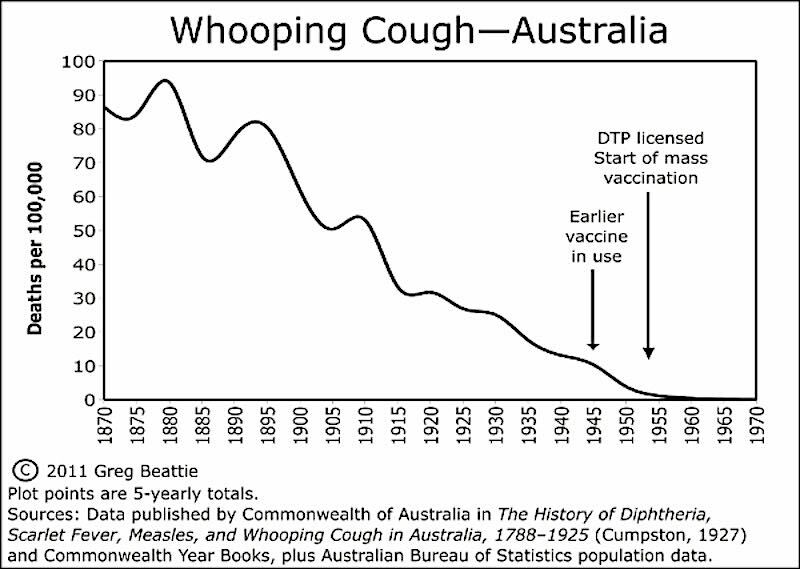 The rates of infectious diseases in Australia were very low from 1950 to 2000 and the majority of the fall in the under 5 mortality rates (80%) had occurred by 1960: prior to the introduction and widespread use of the majority of vaccines. 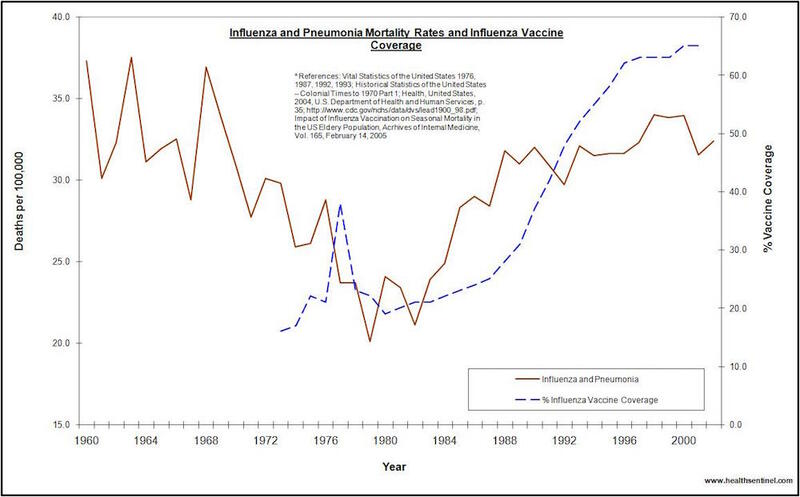 Thus vaccination does not account for the impressive decline in mortality seen in the first half of the century. So perhaps we don’t need to be afraid these diseases will become serious threats if we don’t vaccinate – please don’t believe the scare campaigns run by the vaccine manufacturers and their apologists, they are in it for profit (& power & prestige). * You will find vaccine protagonists never provide long-term mortality graphs to support their arguments – please note that if they give ‘morbidity’ data, morbidity means incidence, not mortality.